Thank you to this week’s contributor, Janice DiPietro, for making this thought-provoking case for family-to-family investing. The article explores investing strategies for family-owned enterprises that can create three important opportunities for both entities involved. If you’re a sports fan, you’ve likely heard of the term “hat trick.” In ice hockey and soccer, it’s when a player scores three goals in a single game. Opportunities to include the next generation of family members in management of the relationship created by this category of investment, e.g. as a board member or designated observer. Increasingly, investing in another family-owned enterprise is an attractive alternative to more traditional investing options. Simply being a family-owned business makes the opportunity unique, requiring customized strategies for growth. As John L. Ward notes in his book Perpetuating the Family Business, a shared set of values is probably the biggest contributor to the sustained success of select family businesses. No one understands these strategies better than others who have led and prospered in a family business setting. Attractive long-term investment. Family businesses are efficient; they don’t waste money on overstaffing and typically have a limited corporate hierarchy. They’re also financially conservative and carry comparatively little leverage. These entities understand performance and family dynamics, adding value. 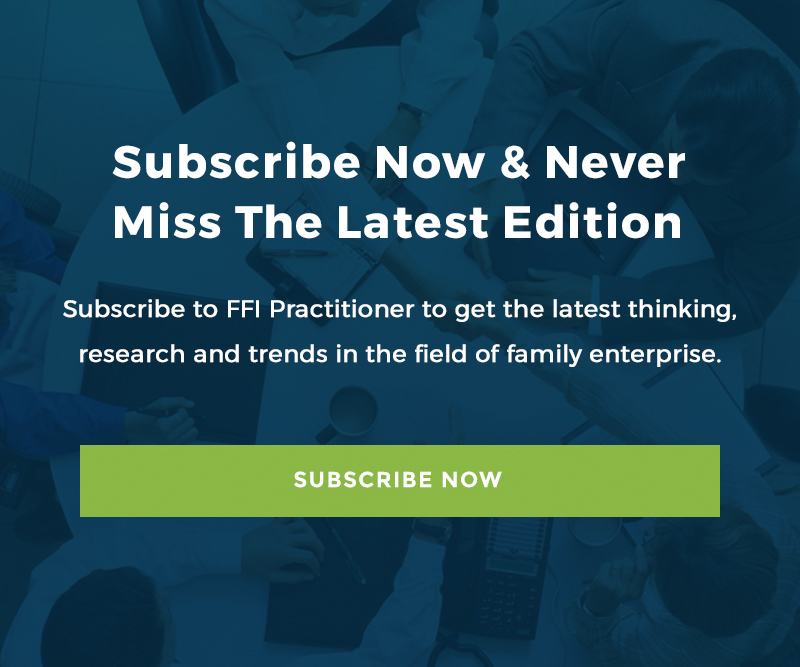 Family-controlled businesses are also more likely to have a strong corporate culture (thanks to traditionally low employee turnover) and practice conservative financial management—all conducive to long-term success. Common goals. Family-controlled business investors have more in common than an outside investor, especially in the middle market. Industry expertise and sourcing deals that match their core competencies can mean long-term success. Due to their shared values, a family-owned business will likely consider the best interests of its family-owned business partner, unlike some outside investment firms. Non-financial goals—maintaining control of the business, preserving the family vision and all the while fulfilling commitments to employees, suppliers, and communities—help family enterprises preserve their culture. A key driver of this success is the connection and identity the owners and family members have with their business. Endurance. Family-controlled businesses tend to be patient investors who are in it for the long term, sometimes referred to as “sticky capital.” They aren’t bound to quarterly expectations of investors or under pressure to sell their businesses within a certain time frame. Most family-owned businesses hold their ownership in businesses they invest in for a longer term, gradually building wealth via a dividend or income distribution strategy rather than looking at capital gains on an exit. Opportunities for the next generation. Family firms will sometimes trade high profit and growth for options that include the whole family. According to Kirby Rosblock, author of The Complete Direct Investing Handbook. A Guide for Family Offices, Qualified Purchasers, and Accredited Investors, family to family investing can establish a foundation for future business growth and wealth appreciation as well as a way for next gen family members to explore different roles in the new business and learn about governance, leadership, and oversight. Finding the right investment partner takes time. Advisers to these companies should be objective and ensure that both entities have similar goals and objectives. Completing a thorough due diligence is also important—applying data analytics to areas like financial analysis, similar to what many private equity investors do. As advisers, we can help our clients consider their options and help identify a strategic partnership, or direct investment that supports their business’s strategy, meets their investment goals, and is a cultural fit. No special skills on the ice necessary. Janice DiPietro is founder and CEO of Boston-based Exceptional Leaders International (E.L.I). She has successfully led and consulted to companies for more than 25 years and has experience in many diverse and complex industries with a focus on family controlled enterprises. Her team of C-level veterans guide family-owned organizations through their most critical transitions and periods of growth to maximize ownership value. She can be reached at [email protected]. Exceptional Leaders International (E.L.I.) is dedicated to guiding clients successfully through periods of growth and transition. It is a team of C-level executives who work with businesses in a broad range of industries, many of which are family controlled. Whether clients are seeking to expand, improve performance, plan for leadership succession, or effect a change in ownership, E.L.I. bridges the needs of the business with those of the family, delivering solutions that solve some of their most challenging problems.